I want to point out a few key frames. First, the full extension of the cut. 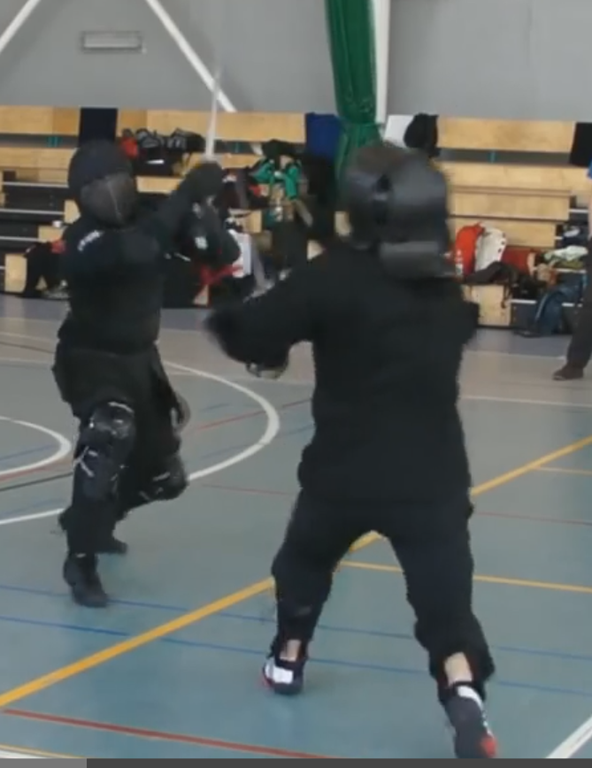 If you cut with an Oberhau from the right side, follow after the cut with your right foot. If you do not do this then the cut is poor and insincere, because your right side lingers behind. The next frame is even more damning. To paraphrase Fiore, the elephant is unbalanced and the castle will soon fall. 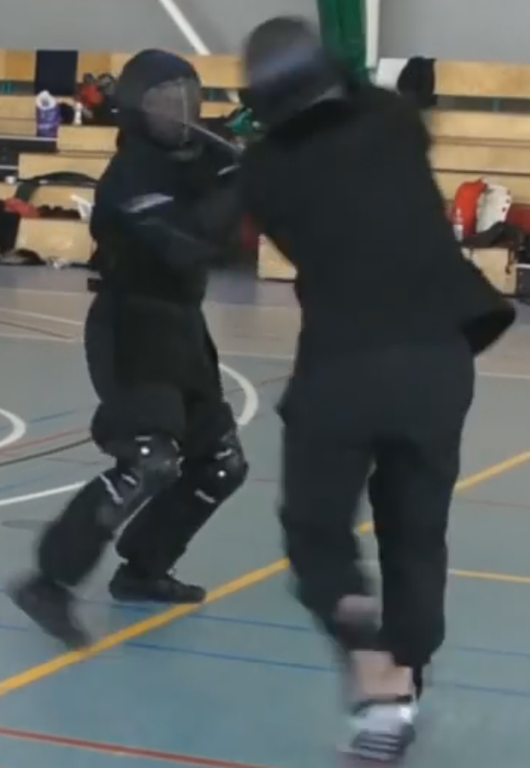 He has no control over his body or sword at this point and won’t regain it until his right foot hits the ground again at the earliest. In the next shot we see his momentum has carried him forward into a compromising position. 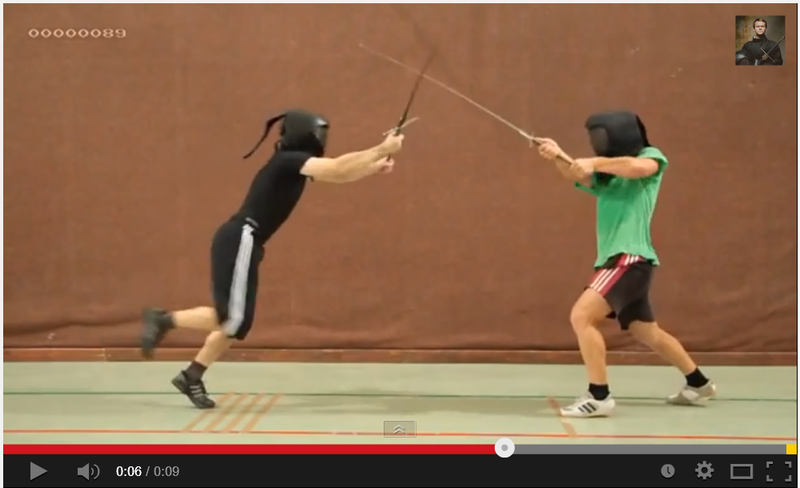 With no creditable threat being presented, the fencer on the right could easily step out to the left with a zwerch. 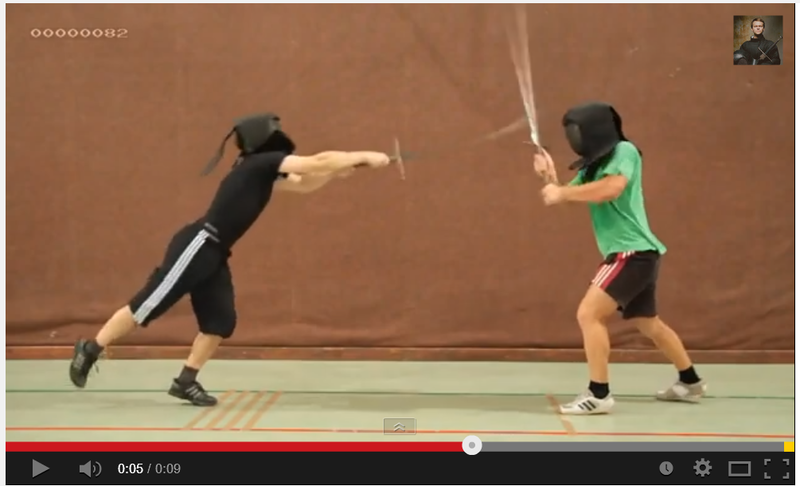 We’ll refer to the fencer on the left as the agent and the one on the right as the patient. The action begins with the agent inching into measure without presenting a creditable threat. So right from the beginning I object to the style of engagement. By the time you get that close you really should have the point threatening your opponent’s face as you launch into your device. The agent makes a small leap forward, not so uncontrolled as the last video, but bad enough. 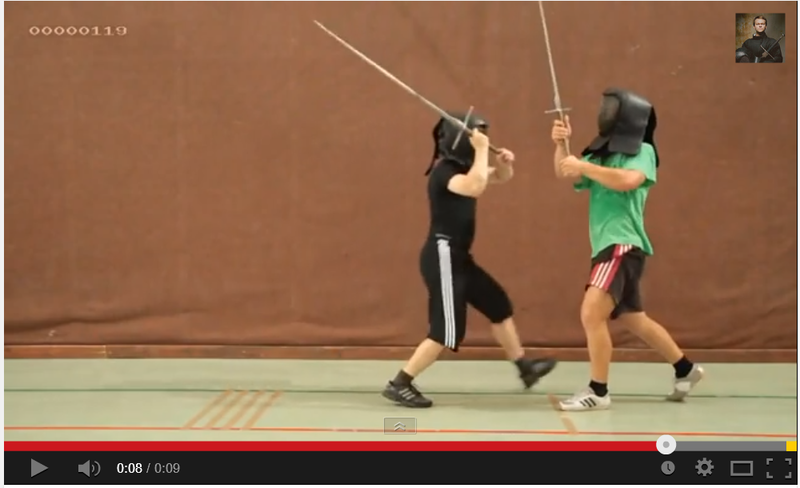 The patient fencer simple steps back allowing the cut to swing wide and expose the upper body. Had the agent attacked with control, rather than just pure speed, then he would have ended in longpoint ready for the thrust. Being in alber, the agent needs to do something to regain cover. I would recommend either stepping back with a thrust or zwerch. Or if he wants to stay in range, pull the hilt high into either ochs or hangort. All of these options offer the point which should keep the patient at bay. Instead he chooses to return to vom Tag, at which point the patient demonstrates how to break vom Tag with a zwerch followed by another. The second strike is the crosswise strike. This breaks the Roof guard. If he then Stands against you and holds his sword with outstretched arms high over his head and threatens to hew in from above at you, then come before him with your hew and spring with the right foot well on your right side against him, and in the spring Wind your sword with the hilt before your head so that your thumb comes under, and strike him with the short edge against his left side to the head. 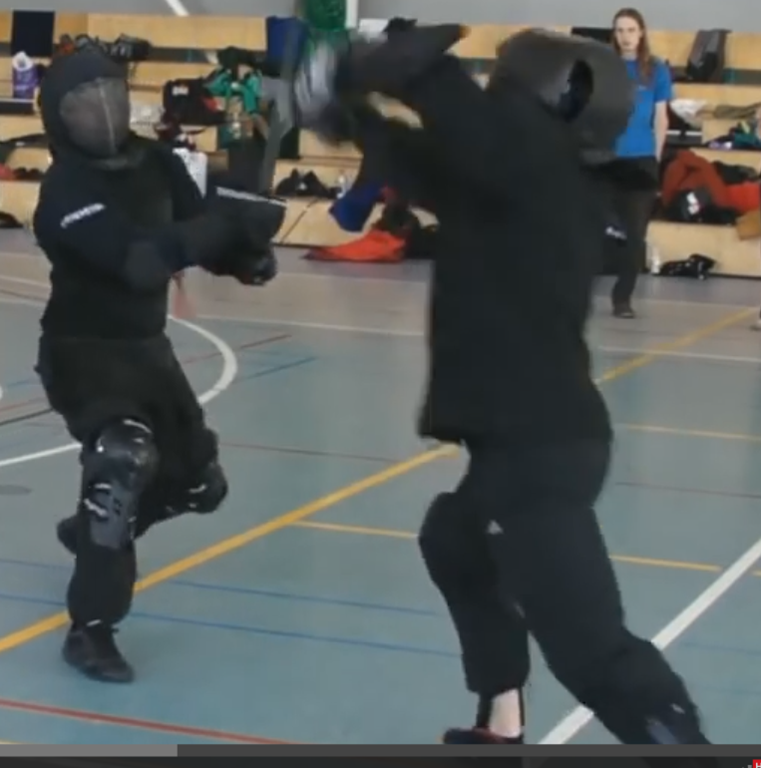 This entry was posted in Longsword. Bookmark the permalink. You are quite wrong with the first video analysis. Right foot follows cut exactly like it’s written in zedel. Following does not mean you have to land with your foot in the same time when your point hits the opponent. Simply cut is twice so quick as step. So you cannot afford to to it in the same time because your cut will be extremely slow. 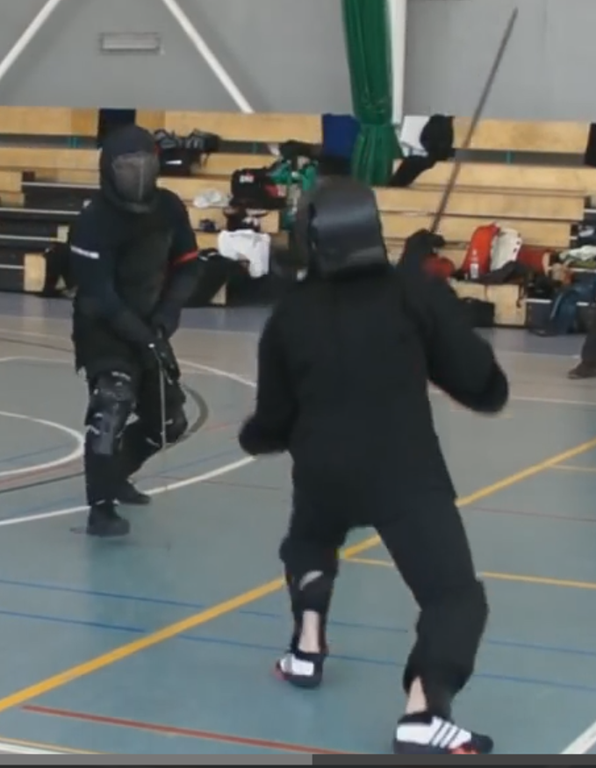 This video was demonstration that you can cut your opponent in time shorter than 250ms from a quite long distance. I don’t even want to analyze your second video description. Cod.44.A.8 says “When your right side remains behind thereby the hew becomes too short”. He isn’t concerned with speed, he wants reach. Likewise Dobringer says “He who moves after strikes may not enjoy any art”. And Meyer is of course very insistant that step with each cut. Now I’m not arguing that the foot must start at exactly the same time, nor that it must land exactly when the cut lands. But no where do I see text or illustration that supports the idea of landing a blow while leaning forward on one toe. Please realize, that the second foot hit the ground 500ms after I start the first visible signal of the strike. 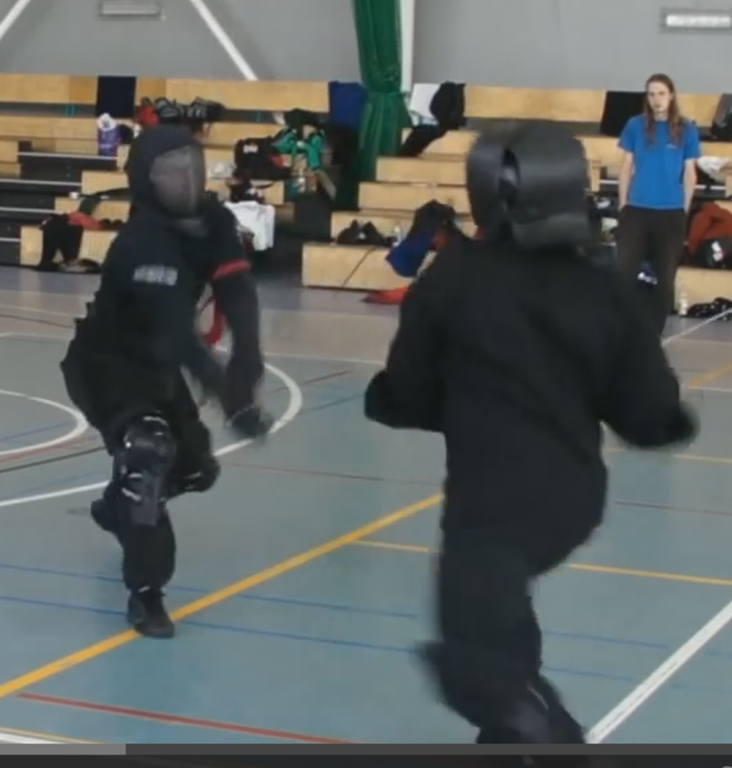 So I would say it is how I imagine how to follow strike with rear leg. So the verses Cod.44.A.8 are fulfilled. And the quote from Hs. 3227a is about completely different thing. It does not tell anything about stepping. I still disagree, but at this point I think neither of us can change each other’s mind. Perhaps we’ll revisit this topic next year. Also, the manuals generally tell us to step to one side or the other rather than straight forward. Those leaps apparently work in tournaments, but to my eyes those are the buffalo strikes we are to scorn. That’s why I like the second video. It shows quite nicely how to defeat people who use the first.